When we think of Austria and sport, it is a natural association to think of winter sports, especially Alpine skiing. But the nation we all should be eternally grateful for the invention of some of the most amazing desserts ever created (Sacher and Linzer torte, Krapfen, Strudel and croissants!) has had a good tradition of tennis not to be forgotten. Thomas Muster is the clearest example, but other good players like Barbara Schett, Sybille Bammer and Tamira Paszek are all Austrian. 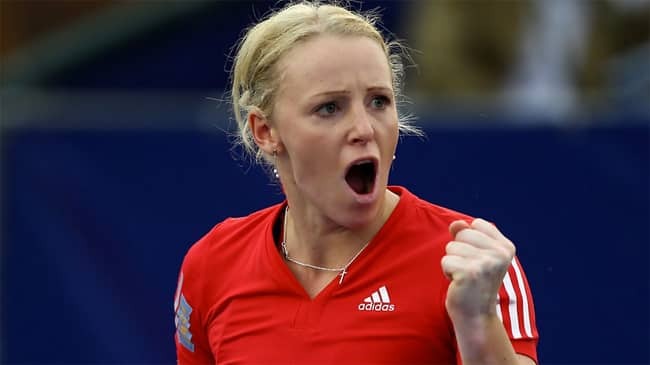 Today, the number one of this nation in the WTA tour is Patricia Mayr-Achleitner, even if the rankings have her second, but Yvonne Meusburger has recently retired. The 26 year old athlete from Tyrol has always been a strong character in the tour, well known for her sincerity, the kind of person that does not restrain her opinions. I could come to appreciate this quality in an interview I have done with her only a few days ago. After many years spent looking for clay events all around the world, in this 2014 she has reached three times the last eitght at a WTA event (Shenzen, Kuala Lumpur and Luxembourg) and all of them were on hard courts. She has also won an important ITF for her, as it is only the second and first in six years, on the same surface in Winnipeg. I was wondering how this transformation came to happen and so this was my first question. That was the moment I immediately realised and appreciated her honesty. “I started to play more on hard courts two years ago, because it's useless to count on the clay season,” she said. “Because the clay court season is too short at WTA level. Also this year I missed most of the clay court tournaments because of an injury. The Austrian’s game is a solid baseline game, her backhand is her best shot, but the quality that strikes the most of her tennis is the ability to lean easily on her opponent’s power. I personally was stunned when I saw her playing and upsetting Sabine Lisicki on the fast indoor conditions of Linz. “Difficult to say (how I play),” she told me. “I started to play more aggressively this year and my service is now also better. So I think I want to try and play a more active game. Even before her new focus on hard courts, the Tyrolese played many good matches in the indoor conditions, testified once more this year when she challenged Genie Bouchard in Linz. “Of course I am not happy with this, because it's unfair...” she told me, reinforcing the words she posted on her Facebook profile when this incident happened. But she is not the kind of girl to live for the past and I had another reason to believe in that when I asked her about her favourite win of the career (she has wins over Yanina Wickmayer, Simona Halep and Elina Svitolina). “I don’t really have one,” she said. “I am happy about every good result. We are all very close. Nonetheless, she is a frequent flyer and has travelled many countries and continents for tournaments, so I asked her about this new wave of Chinese tournaments and her answer had no political correctness. “I don't like to play in China,” she admitted. “It's pretty far for the European players and there are a lot of tournaments there nowadays, so it's tough for us to stay a long time there: different food, different culture. Not easy. And of course it's very expensive to stay a long time there. That’s why I prefer South America and Europe. As my home country is just southern from the border of the Alps, I asked her about Italy. The woman from Rum is one of these players that ended up in a relationship with their coaches. In her case, the two happily married four years ago, but she does not rely on her husband only as a coach. So, as she admitted that she does not know what her life will be when she retires from tennis, all I can wish her is the best for the next season.